Looking to watch content on your actual TV? You can connect your computer to your TV but first you’ll need to check all of your ports to see exactly what you’re working with. The ports should be located on the back of your TV and your computer, unless you have a laptop, in which case they will likely be located on the sides. Here’s a quick rundown of the types of ports and cables you can use to connect your computer to your TV. 3. Change display to "Projector"
Step 1: Choose the necessary cable (or cables) to establish the connection - based on what type of ports you have available between your computer and your TV. The HDMI port is present on all of the newer HDTV sets, though not all computers and laptops have it. If you have HDMI ports on both your computer and your TV, then you are in luck as it is probably the easiest way to connect. The video and audio quality from the HDMI is also very sharp. The DVI port can be found on many of the older LCD TVs. It only has video interface (no audio interface), which means the video quality is even stronger. The VGA port can be found on nearly every HDTV, though you probably won’t find it on older TVs. If you have an HDMI port on your TV but not on your computer, you can always use a DVI to HDMI cable. It has a DVI port on one end and an HDMI port on the other. If your TV has a DVI port but your computer doesn’t, you can use a VGA to DVI cable as long as your computer does have a VGA port. If none of the above options are available, you may want to get a PC to TV converter box. NOTE: If you are using a CRT TV (older model, not a flat screen), you will need a PC to TV Converter Box in order to connect properly. Step 2: Check your computer screen resolution and aspect ratio settings (Make sure the screen resolution matches that of your TV, or else it will result in poor video quality). You can refer to the TV manual to find the screen resolution of your TV. 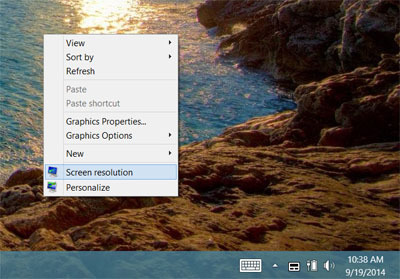 Right-click on your desktop screen and select Screen resolution from the menu that pops up. Adjust the screen resolution with the slider bar (either vertically or horizontally), preferably to the same resolution as your TV for optimum quality. You may first have to click on Screen resolution to bring up this option. 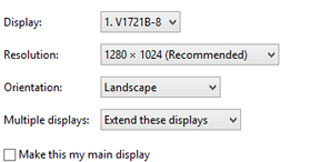 In the "Adjust Resolution" window you should see images of 2 screens, one representing your computer screen and the other representing your TV screen. If you don't see both, then click on "Detect". In the Display: box, you should see a quick description of both your TV model and your computer model (one for screen 1, the other for screen 2). Click on the Windows Start button > Type Displayswitch in the Windows search menu (see image 1 below). You can then choose either Duplicate or Projector only. 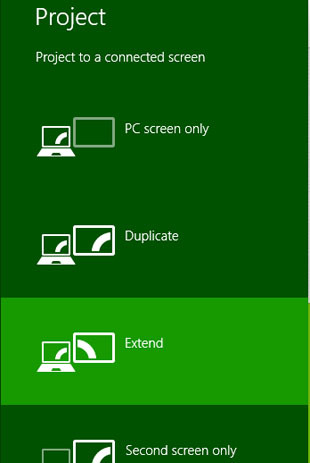 > When you select "Duplicate", you will be able to see the content from your computer on both your computer screen and TV screen. When you select "Projector only", it will only show that content on your TV, and you computer screen will be black. But you still can control everything on your PC, from your TV screen. You can also use Windows Mobility Center, if you have it, for quick connection. Just click on Connect display and you'll be able to adjust all of your display settings. Drag your mouse to the bottom right corner of your screen to bring up the Windows 8 side menu > Click "Search" to bring up the Windows 8 search menu. Search for displayswitch (all one word). 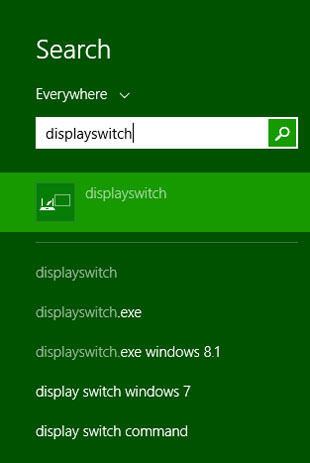 Select the displayswitch option that appears. Choose "Duplicate" if you want to see the computer screen on both the TV and computer. If you want the content from your computer to display on the TV screen only, select "Second screen only"
The easiest way to view your screen display settings on Windows 10 is using the keyboard shortcut "Windows key" + "p"
(hold down the key on your keyboard, usually located near the bottom left, which has the Windows logo on it - then, while still holding down the windows key, press the "p" key). You should then see a display menu like in the images below. Choose "Duplicate" if you want to see the computer screen on both the TV and computer. If you want the content from your computer to display on the TV screen only, select "Second screen only". Click on the Apple logo on the top-left corner of your screen. Click System Preferences, then click Displays. Click Display unless it is already selected. 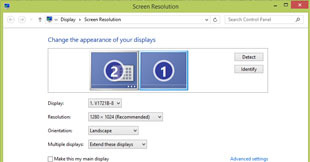 Select your preferred resolution from the list of options (most common screen resolution for standard screens is 1280 x 1024, wide screens - 1280 x 800).